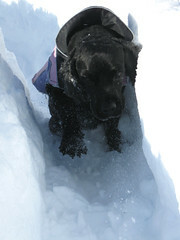 Here is another shot of Poco running through her snow trench. The snow has since shrunk from melting but there is still quite a bit left. It seems we will go the whole month of February without seeing our lawn.